Is there something strange in your neighborhood? Did you light the black candle at the old Sanderson house? Is your name Dracula or Frankenstein? Does the full moon cause you to grow hair, sprout fangs and be really, really good at basketball? Well my friend, you are in luck because it is Frightful Fall at Bookmans! All month long we are celebrating the creepy, the ghostly and the down right monster-y as we host free hallowonderful events in our stores. So grab some candy corn and your “Eleven” from Stranger Things costume and head to your fave used media store for frightenly falltastic fun. Bookmans Speedway kicks off the Halloween fun with their monthly YA Book Club meetup. Things get spooky as they discuss book two of the Peculiar Children series. Don’t miss your opportunity to be one of the grateful u dead at Speedway’s Zombie Fair and finish off October at their annual Halloween Party. This October we demand an answer to the age old question “Who you gonna call?” The answer: Bookmans Grant! Don’t miss out on ghostly fun at Movie in The Park(ing) Lot. Food trucks, crafts and of course the original Ghostbusters! There is no Bookmans, only Zuul! Looking for a good haunt? Stop by for crafts and Trick or Treating at the Halloween Haunting. Bookmans Ina welcomes back House of Herp for a meet-and-greet with real monsters! But you know, the nice kind! Want to decorate your very own trick or treat bag or play funky fun Halloween games? Stop by at the end of the month for Trick or Treat: Halloween Monster Meet. Our Mesa location celebrates our eight legged friends at Spiders, EEK! And All Things Creepy. Celebrate Witchy Wickedness with bubbling cauldrons, potions and spells at Saturday Morning Story Time. Just steer clear of the ol’ H2O. Head north to Bookmans Flagstaff for a slew of terrifyingly terrific events. Like their Massive Monster Movie Night and Masks N’ Monsters Kids Event. Got a sweet costume you’re dying to show off? Stop by the Bookmans Flag Monster Mash Costume Contest and Trick R’ Treat for a costume contest and more! 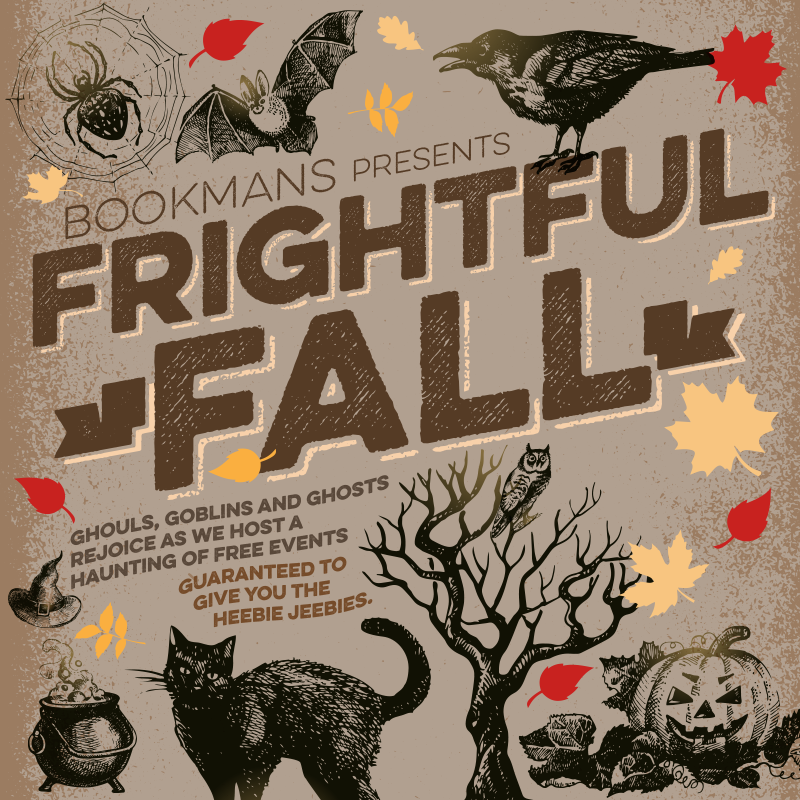 Whether you’re a ghoul, a ghost or a goblin all monsters and trick or treaters are welcome at Bookmans this Frightful Fall! Stop by your local store and check out the haunting of free events guaranteed to give you the heebie jeebies.